What are angiotensin receptor blockers, and how do they work? Angiotensin II is a very potent chemical that causes muscles surrounding blood vessels to contract, thereby narrowing blood vessels. This narrowing increases the pressure within the vessels and can cause high blood pressure (hypertension). 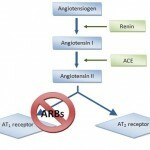 Angiotensin II receptor blockers (ARBs) are medications that block the action of angiotensin II by preventing angiotensin II from binding to angiotensin II receptors on blood vessels. As a result, blood vessels enlarge (dilate) and blood pressure is reduced. Reduced blood pressure makes it easier for the heart to pump blood and can improve heart failure. In addition, the progression of kidney disease due to high blood pressure or diabetes is slowed. 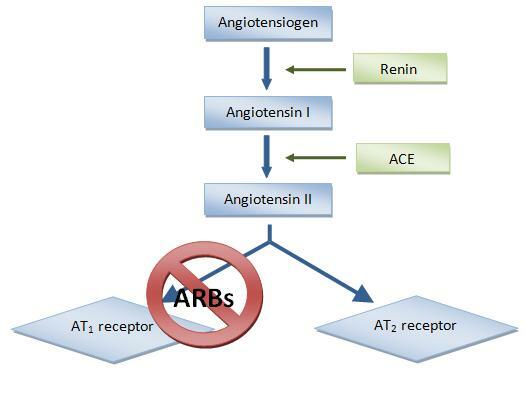 ARBs have effects that are similar to angiotensin converting enzyme (ACE) inhibitors, but ACE inhibitors act by preventing the formation of angiotensin II rather than by blocking the binding of angiotensin II to muscles on blood vessels. ARBs are used for controlling high blood pressure, treating heart failure, and preventing kidney failure in people with diabetes or high blood pressure. They may also prevent diabetes and reduce the risk of stroke in patients with high blood pressure and an enlarged heart. ARBs may also prevent the recurrence of atrial fibrillation. Since these medications have effects that are similar to those of ACE inhibitors, they often are used when ACE inhibitors are not tolerated by patients (for example, due to excessive coughing). ARBs are similar in actions and side effects. They differ in how they are eliminated from the body and the extent to which they are distributed throughout the body. Some ARBs need to be converted to an active form in the body before they can lower blood pressure. In addition, some ARBs are better at lowering blood pressure. In some studies, irbesartan (Avapro) and candesartan (Atacand) reduced blood pressure better than losartan (Cozaar). ARBs are well tolerated by most individuals. The most common side effects are cough, elevated potassium levels in the blood (hyperkalemia), low blood pressure, dizziness, headache, drowsiness, diarrhea, abnormal taste sensation (metallic or salty taste), and rash. Compared to ACE inhibitors, cough occurs less often with ARBs. The most serious, but rare, side effects are kidney failure, liver failure, allergic reactions, a decrease in white blood cells, and swelling of tissues (angioedema). ARBs usually are not prescribed for pregnant patients because they may cause birth defects. Individuals who have narrowing of both kidney arteries or have had a severe reaction to ARBs should avoid them. Like other antihypertensives, ARBs have been associated with sexual dysfunction. ARBs have few interactions with other drugs. Since ARBs may increase blood levels of potassium, the use of potassium supplements, salt substitutes (which often contain potassium), or other drugs that increase potassium may result in excessive blood potassium levels and cardiac arrhythmias. ARBs may also increase the blood concentration of lithium (Eskalith) and lead to an increase in side effects from lithium. Rifampin (Rifadin) reduces the blood levels of losartan, and fluconazole (Diflucan) reduces the conversion of losartan to its active form. These effects could decrease the effects of losartan. What are the available ARBs?